Foils are fired on a thin coat of enamel. When transparent enamels are fired over foil, brilliant color and jewel like effects can be obtained. 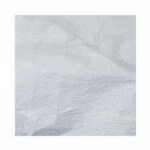 Fine silver foil sold by the sheet (4" x 4") or a book of 25 sheets same size per sheet.